A third passage used to foster belief in an “Antichrist” is 2 Thessalonians 2:1-12. Whatever interpretation is placed upon this passage, its use to refer to a future personage is doomed to failure since Paul explicitly stated that he was referring to a person who would be the product of the circumstances of his own day, i.e., “already at work” (vs. 7). How could Paul have had in mind a future dictator that still has not arisen, though 2,000 years have transpired? One need go no further to know that 2 Thessalonians 2 does not refer to a future Antichrist. History is replete with a variety of interpretations of this passage, the most prominent one likely being the view that the papacy is under consideration (see Workman, 1988, pp. 428-434; Eadie, 1877, pp. 340ff.). Another possibility is that the “falling away” (vs. 3), or apostasy, referred to the Jewish rejection of the “new and living way” of approach to God (Hebrews 10:20). The Jews were the single most adamant opponents to Christ and the infant church (John 8:37-44; Acts 7:51-53; 13:45-50; Romans 10:20-21; 11:7; 1 Thessalonians 2:14-16). This rebellion, or falling away, would not reach its “full” (Matthew 23:32) climax until the destruction of Jerusalem in A.D. 70, and the resulting dispersal of the Jewish people. Paul had already alluded to this Jewish apostasy in 1 Thessalonians 2:15-16. The pouring out of God’s wrath was the logical consequence of the first-century Israelite failure to make the transition to Christianity. According to this viewpoint, the “man of sin” or “son of perdition” (vs. 3) would have referred to the personification of Roman imperialism, and would have been equated with “the abomination of desolation” that Jesus, quoting Daniel 9, alluded to in Matthew 24:15 and Luke 21:20. Verse 4 would refer to the Roman general who introduced his idolatrous insignia into the Holy of Holies in A.D. 70 (cf. Swete, p. xci). That which was “withholding” (vs. 6), or restraining, this man of sin, at the time Paul was writing 2 Thessalonians in approximately A.D. 53, would have been the presence of the Jewish state. The ingenious design of God was that Christianity would appear to the hostile Roman government to be nothing more than another sect of the Jews. Thus Christianity was shielded for the moment (i.e., A.D. 30-70) from the fury of the persecuting forces of Rome, while it developed, spread, and gave the Jews ample opportunity to be incorporated into the elect remnant—the church of Christ (cf. Romans 11:26). Thus the nation of Israel was rendered totally without excuse in its rejection of Christianity, while at the same time serving as a restraining force by preventing Christianity from being perceived by the Romans as a separate, and therefore illegal, religion (religio illicita). Once the Jewish apostasy was complete, and God’s wrath was poured out upon Jerusalem, Christianity came to be seen as a distinct religion from Judaism. Increasingly, Christians found themselves brought into conflict with the persecution from “the wicked” or “lawless one” (vs. 8). In fact, after A.D. 70 (when the withholding effect of Judaism was removed), Roman opposition to Christianity gradually grew greater, culminating in the fierce and formidable persecution imposed by Caesar Domitian in the final decade of the first century. Once the shield of Judaism was removed (vs. 7), and Christianity increasingly found itself subject to the indignities of governmental disfavor, the Lord was to come and “consume with the spirit of His mouth” the one responsible. This terminology is not an allusion to Christ’s second coming. Rather, this verse refers to Christ’s coming in judgment on the Roman power. Such a use of the word “coming” to describe the display of God’s wrath upon people in history is not unusual (cf. Isaiah 19:1; Micah 1:3). Paul alluded to the government’s use of counterfeit miracles (vs. 9), and thus deceit (vs. 10), that is reminiscent of the Concilia’s employment of tricks and illusions to deceive people into worshipping the emperor (Revelation 13:13-15) during the last decade of the first century A.D. (Summers, p. 178; Swete, pp. 170-172). When studied in context, these passages render the notion of an “Antichrist” and the entire dispensational scheme without scriptural support. Those in bygone days who applied these passages to Nero, Napoleon, Mussolini, Hitler, Saddam Hussein, etc. have been proven wrong. Yet the pattern continues unabated among those who have not learned from the sad mistakes of the past. will there be an armageddon? The next feature of the dispensational scheme insists that world history will culminate in a cataclysmic global holocaust known as “Armageddon” (followed by the “Millennium,” a 1000-year reign of Christ on Earth). They say that current events in the Middle East and elsewhere are arranging themselves in such a fashion that the second coming of Christ is imminent. Of course, this claim has been made repeatedly for many, many years—with no fulfillment forthcoming. The term “armageddon” occurs only once in the New Testament: Revelation 16:16. In keeping with the literary genre of the book (i.e., apocalypse [“revelation”]—vs. 1), the term is unquestionably used with figurative connotations. The Holy Spirit capitalized on the meaning which this location possessed for those who would have been familiar with the Old Testament (as Asia Minor Christians would have been). In Hebrew, the term “Harmageddon” means “mountain (or hill) of Megiddo.” Was there a hill of Megiddo? Yes. In fact, Jews were only too familiar with this prominent battlefield and vicinity. Many bloody encounters stained the soil of this region. It was here that Deborah and Barak defeated the Canaanites (Judges 5:19). Gideon was victorious over the Midianites in this area (Judges 7). These positive accomplishments were etched into the Israelite consciousness. But there were other, more vivid, images evoked by Megiddo, for it also served as a place where national tragedy had occurred. Ahaziah died there after being pierced by Jehu’s arrow (2 Kings 9:27). And it was there that good King Josiah perished tragically at the hands of Pharaoh Necho (2 Kings 23:29). With this long historical background, Megiddo came to occupy a place in the minds of believers similar to places which immediately bring to the American mind definite and strong impressions: the Alamo, Pearl Harbor, the Twin Towers, etc. This significance was then utilized by the Holy Spirit to convey to struggling, persecuted Christians of Asia Minor near the end of the first century the sure outcome of the conflict then being waged between the forces of evil (Satan and imperial Rome) and the forces of righteousness (God, Christ, and faithful saints who were enduring). These Christians were certainly in no need of assurance that some future global holocaust would occur which Christ would bring to an end 2,000+ years removed from their suffering. These Christians were in dire need of assurance that Christ would come to their aid soon. They needed encouragement to hang on, and to remain steadfast in the face of inhuman mistreatment. The symbol of armageddon provided that assurance. Christians were given the solace that the outcome of the battle would soon be realized. The enemies of God and His People would be punished, while suffering saints would soon be comforted. Thus “armageddon” is purely symbolic and in no way relates to dispensational dreams of a future world war centered in or emanating from northern Palestine. Dispensationalism also insists that when Jesus returns (for a third time!) to terminate “Armageddon,” He will then usher in the “Millennium”—an alleged thousand-year reign of Christ on Earth in which He will establish a literal, physical kingdom, and rule from Jerusalem. Four contextual indicators militate against a literal 1,000 years in Revelation 20:1-6. First, the events of the book of Revelation were to “shortly take place”—an expression that occurs near the beginning as well as near the end of the book (1:1; 22:6). “Shortly” (en tachei) meant quickly, at once, without delay, soon, in a short time (Arndt and Gingrich, 1957, p. 814; Mounce, 2006, p. 1288; Hengstenberg, 1851, 1:47-49). Moffatt gave the meaning as “soon” and noted: “The keynote of the Apocalypse is the cheering assurance that upon God’s part there is no reluctance or delay; His people have not long to wait now” (n.d., 5:335, emp. added). Other passages where the term is used, confirm that a brief length of time is intended—not merely the rapidity with which the designated events occur, as some have suggested. Regarding those disciples who cry out to God night and day for His intervention, Jesus assured: “He will avenge them speedily (en tachei)” (Luke 18:8). What comfort would be afforded if Jesus intended to convey the idea that relief may be long delayed, but when it finally did come, it would come in a quick fashion? When Peter was asleep in prison, bound with two chains between two soldiers, and an angel awoke him by striking him on the side and instructed him to “arise quickly (en tachei)!” (Acts 12:7), would Peter have understood the angel to mean that he could continue resting or sleeping for as long as he chose, just as long as when he did get ready to get up, he came up off the prison floor with a rapid motion? When Festus insisted that Paul be detained in Caesarea rather than be transferred to Jerusalem, since “he himself was going there shortly (en tachei)” (Acts 25:4), would anyone have understood him to mean that he may delay his visit to Caesarea by years? Paul even used the term in contradistinction with being “delayed” (1 Timothy 3:14-15; cf. White, n.d., 4:117). When Paul wrote to Roman Christians, informing them that “the God of peace will crush Satan under your feet shortly (en tachei)” (16:20), did he mean “in the near future”? Or did he mean that God’s action on their behalf may not come for centuries or millennia, but nevertheless wanted them to be assured that when God finally did act, He would do so in a swift manner? Additional occurrences of the expression further underscore the meaning of “soon” (Acts 10:33; 17:15; 22:18). A second contextual indicator within Revelation itself is the occurrence of the phrase: “for the time is near” (1:3; 22:10). Thayer said “near” (eggus) refers to “things imminent and soon to come to pass” (1901, p. 164; cf. Arndt and Gingrich, p. 213). Such a reference would necessarily pertain to the first century—not the twenty-first. Two or three thousand years would be too late for the desperate Christians of Asia Minor (see Summers, p. 99). Those who get caught up in “millennium mania” seem oblivious to the fact that the book was written to an original, immediate audience. Revelation was, in fact, written to the seven churches of Christ situated in Asia Minor (1:4). All seven are even named (1:11)! If the book was written to them, and if it was their spiritual condition that was the concern of the book, millenarians are incorrect in their contention that the book is devoted primarily, if not exclusively, to predictions of the end times. Though the Old Testament prophets predicted future events on occasion, their primary message was relevant to their immediate audience. Dispensationalists have trouble finding in Revelation a relevant message for a first-century audience. The apostle John recognized their need, and identified himself as their “companion” in the terrible tribulation they were then enduring (1:9). Not only was this tribulation going on at that time, but John further referred to himself and his readers as being in the kingdom at that time (1:9). Thus, Christ’s kingdom was already set up, in existence on Earth, and in full operating mode. Third, there is the statement of the angel to John: “Do not seal the words of the prophecy of this book” (Revelation 22:10). What did the angel mean? What he meant becomes apparent when one reflects upon the fact that Daniel was told to do the exact opposite of what John was told to do. After receiving a remarkable series of detailed prophecies, Daniel was told to “shut up the words, and seal the book until the time of the end” (Daniel 12:4, emp. added). Furthermore, he was instructed: “Go your way, Daniel, for the words are closed up and sealed till the time of the end” (vs. 9, emp. added). The reason Daniel was told to seal the book was because the fulfillment of the prophecies that had been revealed to him were hundreds of years off in the future—far from his own day. The predictions, therefore, would be of no immediate value to the initial recipients of the book. The book could be closed and placed on the shelf until those who would be living at the time of their fulfillment could appreciate the relevance of its predictions. In stark contrast, John was ordered: “Do not seal the words of the prophecy of this book” (22:10, emp. added). Why? The text answers—“for the time is at hand”! These words can hold no other meaning than that the bulk of Revelation was fulfilled in close proximity to the time they were written—2,000 years ago. The verb translated “it is necessary” or “must”…indicates that a moral necessity is involved; the nature of the case is such that the things revealed here must come to pass shortly…. The things revealed here must happen shortly, or the cause will be lost…. They were in need of assurance of help in the immediate present—not in some millennium of the distant and uncertain future (p. 99, emp. in orig.). Indeed, the downtrodden, persecuted Christians of Asia Minor needed assistance right away. The dispensational framework would rob those first-century saints of the very comfort and reassurance they so desperately needed, deserved—and received. Fifth, note the use of the term “signified”: “And He sent and signified it by His angel to His servant John” (1:1, ASV, KJV). This term (seimaino), as is evident from the English translation, means “to show by signs” (Mounce, 2006, p. 1268; Moulton and Milligan, 1930, p. 572; Vincent, 1890, 2:564; Summers, p. 99; Perschbacher, 1990, p. 369; Robertson, 1960, 6:284). The term, along with the Greek word translated “revelation” (apocalupsis), introduces the nature of this book. The book of Revelation reveals or unveils God’s message through signs or symbols. Placing a literal interpretation on the numbers, animals, objects, colors, and locations of Revelation—as dispensationalists routinely try to do—does violence to the true intent of the book. John’s Revelation declares itself to be a book of symbols, filled with figurative language, and not intended to be taken literally. In fact, as Swete observed, “much of the imagery of the Apocalypse is doubtless not symbolism, but merely designed to heighten the colouring of the great picture, and to add vividness and movement to its scenes” (p. cxxxiii). A genuine recognition of this self-declared feature of the book excludes a literal interpretation of the number 1,000. In addition to these preliminary contextual details, chapter 20 contains specific features that assist the interpreter in pinpointing the meaning of the symbol of a “thousand year reign.” It is surely noteworthy that in the entire Bible, the only allusion to a so-called thousand-year reign is Revelation 20:4,6—a fact that is conceded even by dispensationalists (e.g., Ladd, 1972, p. 267; Mounce, 1977, pp. 356-357). Yet an entire belief system has been built upon such scanty evidence. An examination of the setting and context yields surprising results. For example, a simple reading of the immediate context reveals that the theme of Revelation 20 is not “the thousand-year reign of Christ.” Rather, it is “victory over Satan.” Each of the symbols presents concepts that, when put together, relieve the fears of oppressed Christians regarding their outcome. The key, abyss, and chain (vs. 1) are apocalyptic symbols for the effective limitation or containment of Satan in his ability to deceive the nations in the specific matter of emperor worship enforced by the government (see Swete, pp. xxxi, civ-cv). The symbol of one thousand years (vss. 2-7) is a high multiple of ten, representing ultimate completeness (see Summers, pp. 23). John’s readers thus could know that the devil was to be completely restrained from deceiving the nations into worshipping the emperor. The thousand years symbolized the extended triumph of God’s kingdom on Earth over the devil who was then operating through the persecuting powers of Rome. A thousand symbolic years of victory would lessen suffering in the minds of persecuted Christians. “Loosing for a little season” (vs. 3) represented the revival of persecution under later emperors like Aurelius, Diocletian, and Julian the Apostate. “Thrones” (vs. 4) represented the victorious power of the oppressed. The persecuted saints were pictured on thrones judging because of the victory of their cause. “Souls” (vs. 4)—not resurrected bodies, but disembodied souls—represent those who were martyrs of the Domitianic persecution. Their refusal to “receive the mark” meant they refused to worship Caesar or to manifest those marks that would identify them as adherents of the false state religion of emperor worship. The “first resurrection” (vs. 5) referred to the triumphant resurrection of the cause for which the Christians of 20:4 had lived and died. Gog and Magog were symbolic of the enemies of God and Christ, imagery drawn from Ezekiel 38 and 39. The “beloved city” (vs. 9) is spiritual Israel, the church (John 4:20-21; Galatians 6:16). Some allowance may be granted in the interpretation of these highly figurative symbols, without doing damage to other Bible doctrines, or reflecting adversely upon the Gospel system and the broader will of Deity. However, the 1,000 years must not be perceived as a yet-future period. There is simply no biblical support for doing so. The figure represents an important concept for those to whom it was first directed. It has meaning for people living today only in that context. There will be no 1,000-year reign of Jesus Christ on Earth. Is the kingdom yet to be established? Dispensationalists further claim that the kingdom is yet future, and that Jesus is not reigning now, but will commence His reign in His kingdom when He returns in the future to establish it in Jerusalem. However, several passages cannot be harmonized with such a view. First, the Bible teaches that the kingdom exists now and has existed since A.D. 30. While Jesus was on Earth, He went to Galilee, “preaching the gospel of the kingdom of God, and saying, ‘The time is fulfilled, and the kingdom of God is at hand. Repent, and believe in the gospel’” (Mark 1:14-15). He also stated that “there are some standing here who will not taste death till they see the kingdom of God present with power” (Mark 9:1). In fact, God “has delivered us from the power of darkness and conveyed us into the kingdom of the Son of His love” (Colossians 1:13, emp. added). To insist that the kingdom is yet to be established is to fail to recognize that the Bible plainly declares that the kingdom already exists on Earth. Second, the words “kingdom,” “Israel,” and “church” all refer to the same group of people—the saved, Christians, the church of Christ, spiritual Israel. Jesus predicted that He would build His “church” and give to Peter the keys of the “kingdom” (Matthew 16:18-19). Jesus did not build one institution and give to Peter the keys to a different institution that would be established on Earth 2,000+ years after Peter’s death. Paul told the Galatian Christians: “Therefore know that only those who are of faith are sons of Abraham.… And if you are Christ’s, then you are Abraham’s seed, and heirs according to the promise” (Galatians 3:7,29; cf. 6:16). He told Christians in Rome: “For he is not a Jew who is one outwardly, nor is circumcision that which is outward in the flesh; but he is a Jew who is one inwardly; and circumcision is that of the heart” (Romans 2:28-29). Spiritual Israel is the church of Christ which is the kingdom. One like the Son of Man coming with the clouds of heaven! He came to the Ancient of Days, and they brought Him near before Him. Then to Him was given dominion and glory and a kingdom, that all peoples, nations, and languages should serve Him. His dominion is an everlasting dominion, which shall not pass away, and His kingdom the one which shall not be destroyed (7:13-14, emp. added). This prophecy was fulfilled at the ascension of Christ: “while they watched, He was taken up; and a cloud received Him out of their sight” (Acts 1:9). Jesus returned to heaven where He was given rule over His kingdom. Peter made this fact clear in his remarks on Pentecost: “God had sworn with an oath to him that of the fruit of his body, according to the flesh, He would raise up the Christ to sit on his throne, he, foreseeing this, spoke of the resurrection of the Christ.... This Jesus God has raised up, of which we are all witnesses. Therefore, being exalted to the right hand of God...” (Acts 2:30-33, emp. added). So Jesus was reigning at that moment over His kingdom. Paul expressed the same truth: “He raised Him from the dead and seated Him at His right hand in the heavenly places, far above all principality and power and might and dominion, and every name that is named, not only in this age but also in that which is to come. And He put all things under His feet” (Ephesians 1:20-22). Hence, when Jesus returns a second time, it will not be to reign on Earth. Rather, “[t]hen comes the end, when He delivers the kingdom to God the Father, when He puts an end to all rule and all authority and power. For He must reign till He has put all enemies under His feet” (1 Corinthians 15:24-25, emp. added). Fourth, Jesus completed His work on Earth and, consequently, has no reason to return to the Earth, itself, to do any additional work. He explained to the disciples: “My food is to do the will of Him who sent Me, and to finish His work” (John 4:34, emp. added). Shortly before His departure from the Earth, He prayed to the Father: “I have glorified You on the earth. I have finished the work which You gave Me to do” (John 17:4, emp. added). He reiterated this fact on the cross when He declared: “It is finished” (John 19:30). Dispensationalists say that Jesus came with the intention to be King, and to set up an earthly kingdom, but that the Jews unexpectedly rejected Him. But this claim is in direct conflict with the facts. On one occasion, after feeding thousands of people with five loaves of bread and two fish—a feat that would constitute a tremendous advantage should war with Rome be forthcoming—John noted that “when Jesus perceived that they were about to come and take Him by force to make Him king, He departed again to a mountain by Himself alone” (6:15, emp. added). If Jesus intended to establish a physical kingdom on Earth, that occasion would have been the perfect time to do so—with the support of the masses. So why did Jesus refuse to be made a king on Earth on a physical throne? He gave the reason to Pilate: “My kingdom is not of this world. If My kingdom were of this world, My servants would fight, so that I should not be delivered to the Jews; but now My kingdom is not from here” (John 18:36). The dispensational claim that Jesus is coming back to be a king on Earth on a physical throne is the very thing first-century Jews tried to get Him to do—but which He refused to do—and which He denied before Pilate. Did Jesus lie to Pilate? but what about the promises to Israel? Many these days insist that God made clear promises in Scripture to physical Israel that are yet to be fulfilled and which absolutely must be fulfilled, and that they play a prominent and continuing role in God’s scheme of things. This contention has had a profound impact upon U.S. foreign policy and in the way people around the world—especially in the Middle East—perceive America. It is surely a shock to find that the Bible depicts no such favored status. All people stand on level ground at the foot of the cross of Christ. God is no respecter of persons and makes no distinctions between people on the basis of ethnicity (Acts 10:34-35; Romans 2:11,28-29; Galatians 3:28). The promises that were made to physical Israel in the Old Testament were fulfilled long ago. For example, God announced to Abraham that He would give to his descendants (the Israelites) the land of Canaan (Genesis 12:1; 15:7). This promise was fulfilled when Israel took possession of Palestine in the 15th century B.C. (Joshua 21:43-45; 2 Chronicles 9:26). What so many people today fail to recognize is that Israelite retainment of the land was contingent upon their continued obedience (Leviticus 18:24-28; Joshua 23:14-16; 1 Kings 9:3-7). But, sadly, they forfeited retention of the land due to their incessant disobedience and continual rejection of God’s guidance. The complete and final cutoff of physical Israel took place in A.D. 70—as Jesus mournfully announced: “O Jerusalem, Jerusalem, the one who kills the prophets and stones those who are sent to her! How often I wanted to gather your children together, as a hen gathers her chicks under her wings, but you were not willing! See! Your house is left to you desolate” (Matthew 23:37-38). Further, the reestablishment of national Israel, and the rebuilding of Jerusalem and the Temple (i.e., the national promises of Deuteronomy 30 and Zechariah 12-14) were literally fulfilled in the returning remnant after the Babylonian captivity (Nehemiah 1:8-10; Isaiah 10:22; Jeremiah 23:3; Ezra 3:1-11). The establishment of the modern state of Israel in May of 1948 cannot supplant this already achieved fulfillment and has nothing to do with the original promises made to Abraham and his descendants. Many of the Old Testament prophecies that predicted the return of the Jews after captivity were laced with predictions of the coming Christ to the Earth to bring ultimate redemption. Hence, the national promises were spiritually fulfilled in the church of Christ wherein both Jews and Gentiles are one in Christ. For example, premillennialists are fond of calling attention to the concluding prophetic remarks of Amos: “‘On that day I will raise up the tabernacle of David, which has fallen down, and repair its damages; I will raise up its ruins, and rebuild it as in the days of old; that they may possess the remnant of Edom, and all the Gentiles who are called by My name,’ says the Lord who does this thing” (Amos 9:11-12). They insist that the fulfillment of this prophecy is yet future. They say the Temple, which was destroyed in A.D. 70 by the Romans (Matthew 23:37-24:35), will be rebuilt on the Temple platform in Jerusalem (a site currently occupied by the third most holy shrine of Islam—the Dome of the Rock). They say that Jesus will return, set up His millennial kingdom, and reign on a literal throne for a thousand years, incorporating the Gentiles, in addition to the nation of Israel, into His kingdom. On the face of it, this prophecy certainly possesses terminology that fits the millenarian spin placed upon it. However, two Bible passages correct this mistaken interpretation, and settle the question as to the proper application of Amos’ prophecy. The first is the great Messianic prophecy uttered by the prophet Nathan to King David regarding David’s future lineage and royal dynasty (2 Samuel 7:12-16). Nathan declared that God would establish and sustain the Davidic dynasty. Even though he also noted that a permanent form of the Tabernacle (the one God refused to allow David to build—2 Samuel 7:1-7) would be built by David’s son (i.e., Solomon), God, Himself, would build David a house, i.e., a dynasty, a kingly lineage. It is this lineage to which Amos referred—not a physical temple building. In light of James’ inspired application of it to the integrated church of the first century, the Amos prophecy, like all others in the Old Testament that dispensationalists wish to apply to the future, find their ultimate and final climax in the momentous advent of the Christian religion on the planet—2,000 years ago. The premillennial treatment of prophecy, in the final analysis, demeans and trivializes the significance of the Gospel, the church of Christ, and the Christian religion as the final revelation from God to mankind. A careful and consistent appraisal of Bible teaching forces one to conclude that all promises made to physical Israel have either been fulfilled or forfeited through disobedience. All who wish to be acceptable to God must submit to Jesus Christ now (John 3:5; 8:24). [NOTE: Compare the use of “now” in Romans to refer to the Christian age which began at Pentecost: 3:26; 5:9,11; 8:1,18; 11:5; 13:11; 16:26.] Christians need not fear any of the political, economic, or military developments of today or tomorrow. God has given us simple instructions on how to become a Christian, how to live the Christian life, and the need to urge others to do the same. God deals with all human beings today on the same basis and on the same grounds—obedience to Christ’s will. “Nor is there salvation in any other, for there is no other name under heaven given among men by which we must be saved” (Acts 4:12). The sensationalism and hysteria associated with the ongoing attempt to apply long since fulfilled Bible prophecy to the current events of today is seductive. But it only serves the purpose of diverting people’s attention away from their daily responsibility to live obediently and faithfully now. The Bible portrait of the end times is much simpler and succinct. The Bible teaches that at some point in the future, unknown even to the angels (Matthew 24:36), Jesus will return in flaming fire (2 Thessalonians 1:8). He will hover among the clouds without ever setting foot on the Earth (Acts 1:11; 1 Thessalonians 4:17). At that point, all who are in the graves will be resurrected (Luke 14:14; John 5:28-29) and changed (1 Corinthians 15:52-53). The righteous will rise to meet the Lord in the air (1 Thessalonians 4:17). Then all people who have ever lived, both good and evil, will stand in judgment before God (Matthew 25:31-46; Revelation 20:11-13; 2 Corinthians 5:10). The wicked will be consigned to hell, while the righteous will be welcomed into heaven (Romans 2:5-10). When one is willing to remove from his mind all preconceived and complex theological concoctions, and simply let the Bible paint its own picture of the end of time and the second coming of Christ, the dispensational viewpoint is seen to be convoluted, concocted, and unfounded. 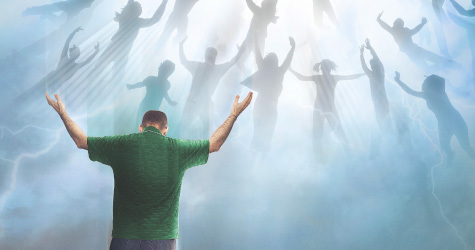 There will be no “Rapture.” There will be no “Antichrist.” There will be no “Great Tribulation.” There will be no “Armageddon” or “Millennium” on Earth. Eadie, John (1877), Commentary on the Epistles to the Thessalonians (Grand Rapids, MI: Baker, 1979 reprint). Hengstenberg, E.W. (1851), The Revelation of St. John, trans. Patrick Fairbairn (Edinburgh: T.&T. Clark). Ladd, George E. (1972), A Commentary on the Revelation of John (Grand Rapids, MI: Eerdmans). Lindsey, Hal (1970), The Late Great Planet Earth (Grand Rapids, MI: Zondervan). Moffatt, James (no date), The Revelation of St. John the Divine in The Expositor’s Greek Testament, ed. Nicoll, W. Robertson (Grand Rapids, MI: Eerdmans). Moulton, James and George Milligan (1930), The Vocabulary of the Greek Testament (Grand Rapids, MI: Eerdmans), 1982 reprint. Mounce, Robert (1977), The Book of Revelation (Grand Rapids, MI: Eerdmans). Mounce, Robert (2006), Mounce’s Complete Expository Dictionary of Old and New Testament Words (Grand Rapids, MI: Zondervan). Perschbacher, Wesley (1990), The New Analytical Greek Lexicon (Peabody, MA: Hendrickson). Robertson, A.T. (1960), Word Pictures in the New Testament (Nashville, TN: Broadman). Summers, Ray (1951), Worthy Is the Lamb (Nashville, TN: Broadman). White, Newport (no date), The First and Second Epistles to Timothy in The Expositor’s Greek Testament, ed. W. Robertson Nicoll, (Grand Rapids, MI: Eerdmans). Workman, Gary (1988), Studies in 1 and 2 Thessalonians and Philemon (Denton, TX: Valid Publications). Bales, J.D. (1972), Prophecy and Premillennialism (Searcy, AR: James Bales). Barclay, William (1960), The Revelation of John (Philadelphia, PA: Westminster). Hailey, Homer (1979), Revelation (Grand Rapids, MI: Baker). Harper, E.R. (no date), Prophecy Foretold Prophecy Fulfilled (Nashville, TN: Gospel Advocate). Jackson, Wayne (no date), Premillenialism: A System of Infidelity (Stockton, CA: Christian Courier). Turner, Rex (1979), The Premillennialists’ Abuse of the Prophecies of Daniel (Memphis, TN: Getwell church of Christ). Winkler, Wendell, ed. (1978), “Premillennialism, True or False?” (Fort Worth, TX: Winkler Publications).